CB(t) is the radioactivity concentration in the blood, VB is the vascular volume fraction inside the region of interest, and Ci(t) is the radioactivity concentration in the ith tissue compartment. The smaller that is, the better match we have between the measured and simulated curves. Optimization algorithm is used for iteratively moving from one set of compartmental model parameters (p̂) to a set of parameters, which provides smaller Χ2, until progress is stalled or until a fixed maximum number of iterations has passed. As a result of this non-linear least-squares (NLLS) method, we have estimates of the rate constants. Outlier detection can be implemented in the optimization algorithm (Huang, 2008). If the criterion function has multiple local minima, the iterative search may end up at any one of these, leading to more or less flawed model parameter estimates. Therefore we are often applying global optimization algorithms, although they take much more computation time. If no constraints are imposed on the parameters, the minimum could correspond to a physically unrealisable set of parameters. Noise and inadequate handling of the vascular volume fraction in the initial phase of the tissue TAC may lead to “impulse phenomenon”, where an initial peak in the data that actually is just noise is interpreted as representing very fast kinetics of the first tissue compartment, leading to improper rate constant estimates (Huang et al., 2018). At least negative parameter values would be non-physiological and should be ruled out. Certain compartmental models can be linearized, and parameters solved using e.g. non-negative least-squares (NNLS) method. One dynamic PET image contains several regions of interest, which usually are analyzed individually. Usually, however, we can assume that certain model parameters are common to all regions. If the TACs from several regions are fitted simultaneously, keeping the assumption of one or more common parameters, all of the parameters can in theory be estimated more reliably (Huesman & Coxson, 1997). Also the input function can be assumed to be the same for all regions, which is utilized in model-based input function estimation. However, the number of parameters to fit in SIME methods can be very large, and many usual optimization methods do not work reliably. Dai X, Chen Z, Tian J. 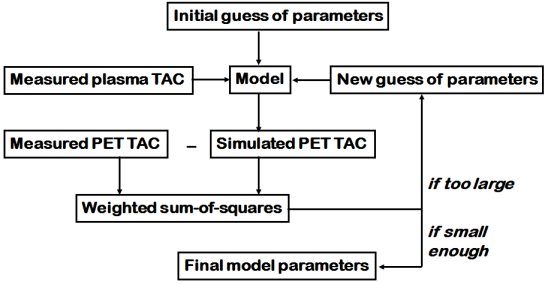 Performance evaluation of kinetic parameter estimation methods in dynamic FDG-PET studies. Nucl Med Commun. 2011; 32(1): 4-16. Huang S-C. Detection of measurement outliers in tracer kinetics. IFAC Proceedings Volumes 2008; 41(2): 6654-6657. Huang C-K, Wang W, Tzen K-Y, Lin W-L, Chou C-Y. FDOPA kinetics analysis in PET images for Parkinson’s disease diagnosis by use of particle swarm optimization. 2012 9th IEEE International Symposium on Biomedical Imaging (ISBI), 586-589. Huesman RH, Coxson PG. Consolidation of common parameters from multiple fits in dynamic PET data analysis. IEEE Trans Med Imaging 1997; 16(5): 675-683. Kadrmas DJ, Oktay MB. Generalized separable parameter space techniques for fitting 1K-5K compartment models. Med Phys. 2013; 40(7): 072502/16. Raylman RR, Hutchins GD, Beanlands RSB, Schwaiger M. Modeling of carbon-11-acetate kinetics by simultaneously fitting data from multiple ROIs coupled by common parameters. J Nucl Med. 1994; 35: 1286-1291. Young P: Everything You Wanted to Know About Data Analysis and Fitting but Were Afraid to Ask. Springer, 2005. ISBN 978-3-319-19051-8.